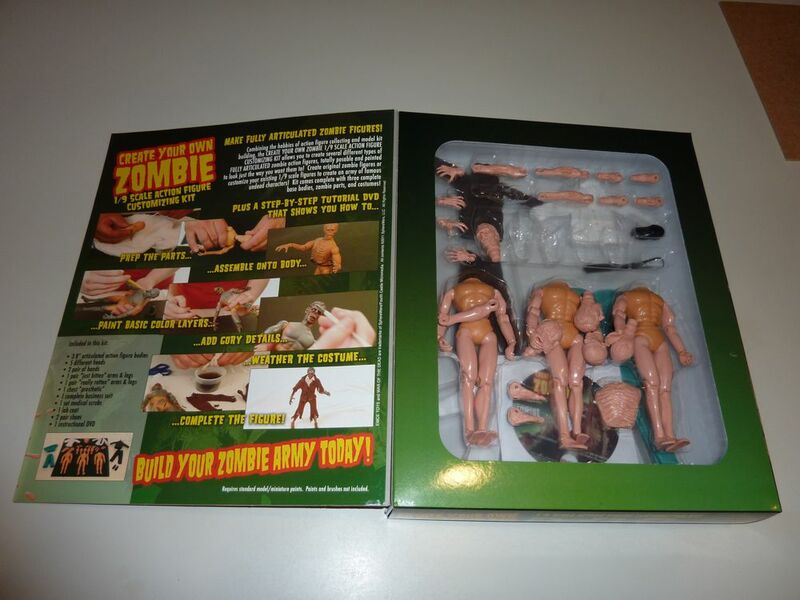 EMCE Toys has just release their Create Your Own Zombie kit. 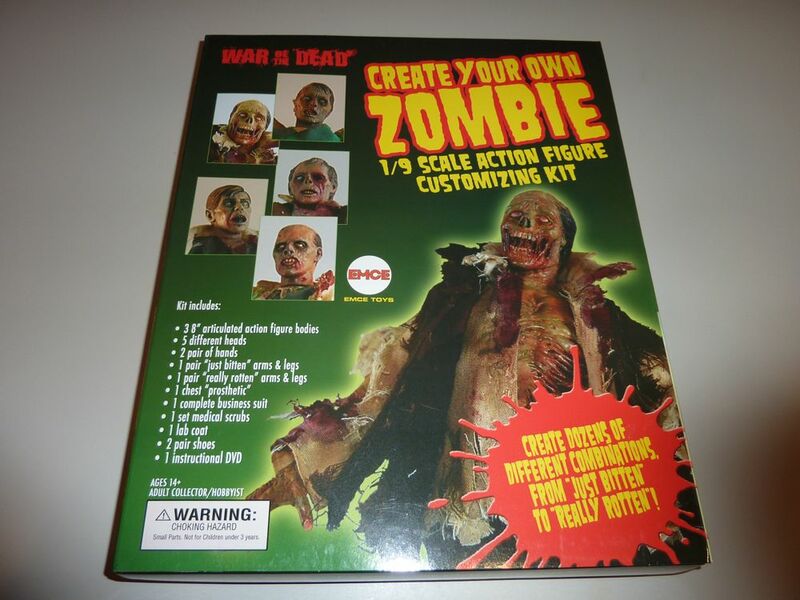 The kit give you the pieces and instructions to create your own unique 1/9 scale zombie action figures. It uses the Mego body from the 70s, but with more updated sculpting details. This kit was first revealed at the 2011 Toy Fair last February and was well received. The box is a flapped window-box, so you can see all the stuff your getting. Unfortunately, mine had become all scambled in shipping, but you could still see everything and where it was suppose to be. 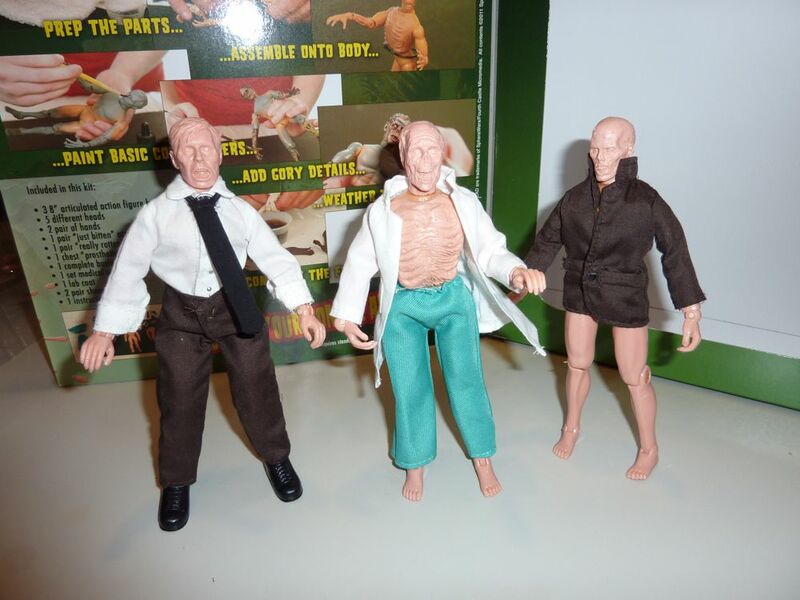 The kit contains 3 reproduction Doc Mego bodies, 5 heads, 2 pairs of zombie hands, 2 pairs of zombie arms, 2 pairs of zombie legs, 1 chest prosthetic, 1 medical suit, 1 business suit, and one pair of shoes. The box says 2 pair of shoes, but mine only came with one and there only appears to be a place for 1 pair. 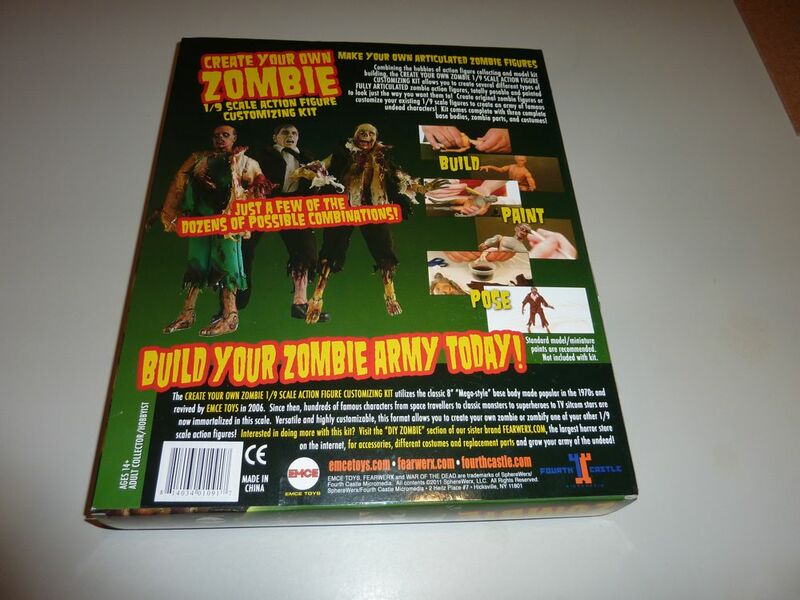 All of the zombie parts are make of PVC plastic and look great with sharp details. The neck plus on the heads are smaller than the normal vinyl heads, like most resin custom heads, so they can fit into the bodies without much force. I did find the skeleton (most zombiefied) head to be a bit loose when I put it on a body, but the other heads I tried were a nice tight fit. The clothes are very nice with good details, like the small buttons on the shirt. I bet some people, like myself, will have trouble taking a scissors to such nice clothes. 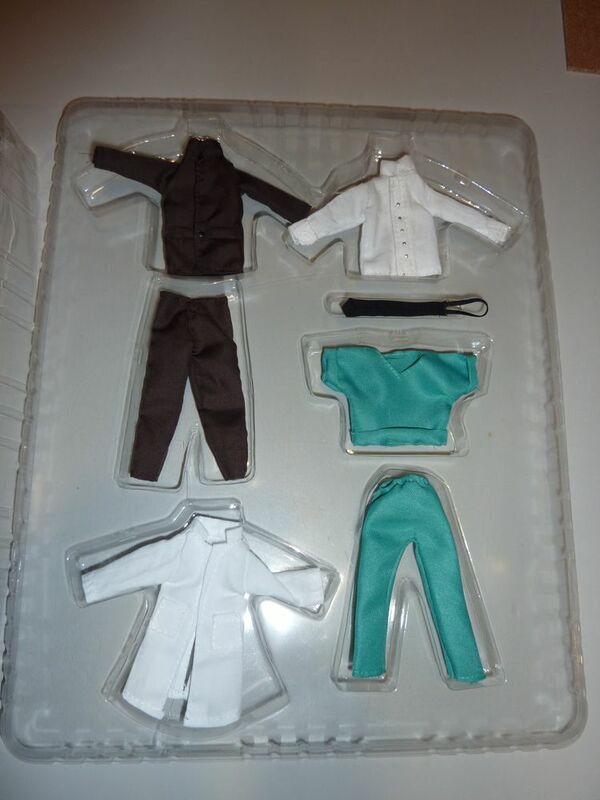 I did find the scrub shirt and suit jacket a little small and difficult to put on the bodies. However, since they are meant to be ripped up, this isn't a big issue and I'm sure they can be used as-is with a little perseverance. The video instructions included are very nice. The voice over and video quality is great. Its very engaging and informative and really makes you want to jump in and start customizing. It would be great video to have on a loop in a hobby store. I threw together some of the piece to give an idea of what they might look like, but I need to use more of the zombie body parts and paint the pieces. 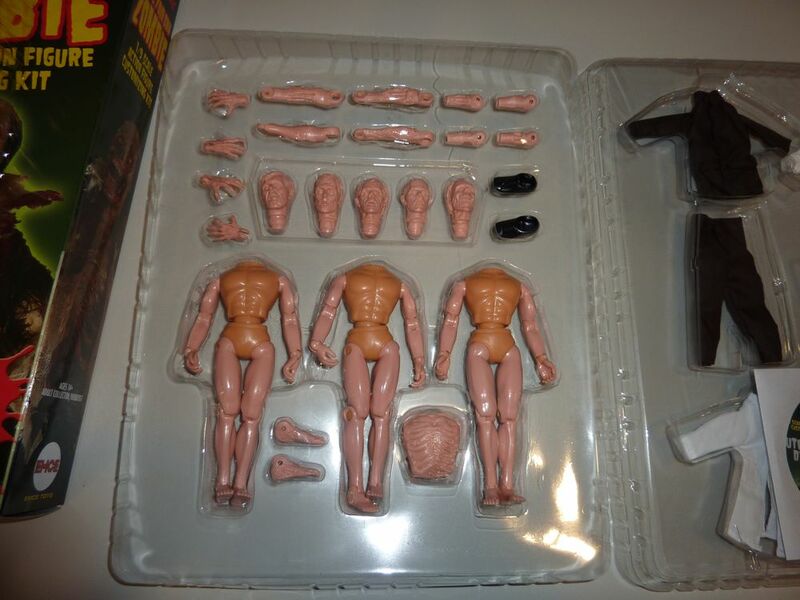 Overall I'm quite pleased with the set and hope it brings more people into customizing Mego figures. My only complaint is that I wished it came with a few more pieces. I would gladly give up one of the heads for another pair of pants and shoes. I would also suggest putting the video up on Youtube, as it would be great advertising. I will try to make some zombies and update this post with the results.